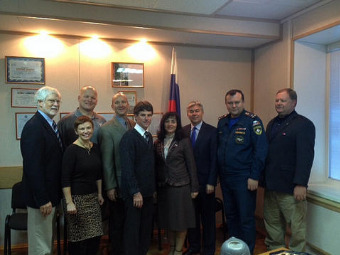 A delegation of Los Alamos leaders is meeting in Sarov, Russia, the Sister City of Los Alamos. These interactions, involving County Council Chair Geoff Rodgers, County Administrator Harry Burgess, Fire Chief Troy Hughes, Deputy Fire Chief Justin Grider and other leaders have reinforced the understanding that our citizens are more alike than we are different, our communities have extraordinary similarities, our countries have more to gain through friendship and cooperation than through competition. The people of our communities share love for our families, commitment to our future through our children, a strong desire to ensure the well being of all our citizens, and pride in our countries. And we can learn from each other.Our Sister Cities Program involves exchange visits of students, government officials, teachers, librarians, social workers, and many other citizens. What we take away from these exchanges is friendship, understanding, practical insights, and an unshakable belief that the citizens of our two communities - and indeed of our countries - are joined at the heart, and that our common future is better served by working together.